Look what I found when I cleaned off the black soot! You don't often see these size rocks in an early Brookfield beehive. See [id=392838625] for a closer look at the junk. 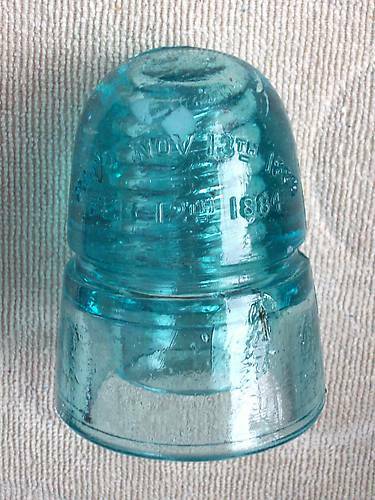 The embossing is so crisp and bold it must've been one of the first insulators to come out of a brand new mold. The shop number is a backwards 1 with a 0 embossed over something else that makes the 0 look like a Q. [id=392838548] There's also a few short amber streaks, one of which causes a small internal fracture as seen in the rear skirt. Beyond that, it's about perfect! Thanks for looking.